Change is the only constant. Along these lines, Delta 9’s company name has hidden-in-plain-sight. While Delta is the triangular Greek letter for change, Delta 9 most known as shorthand for delta-9-tetrahydrocannabinol, or THC, the most well-known psychoactive cannabinoid. Although I typically get psychoactive (delta-9) THC oil, I’m looking for a high CBD cartridge to relieve my new post-workout aches and pains without making me goofy or knocking me out. I thought I’d achieve this tranquility and focus by living with Tibetan monks but said “eh” and tried the DeltaMax 2.0 Natural 5:1 CBD:THC cartridge instead. (It’s cold year-around up there and the gym has a sauna). My arms, chest and thighs are still stiff from yesterday’s new gym routine so I’m hoping this cartridge will alleviate the pain as I run few local errands to prep for Sunday dinner. Will walking and carrying plastic grocery bags be a problem? Let’s find out this and more as we break it down. 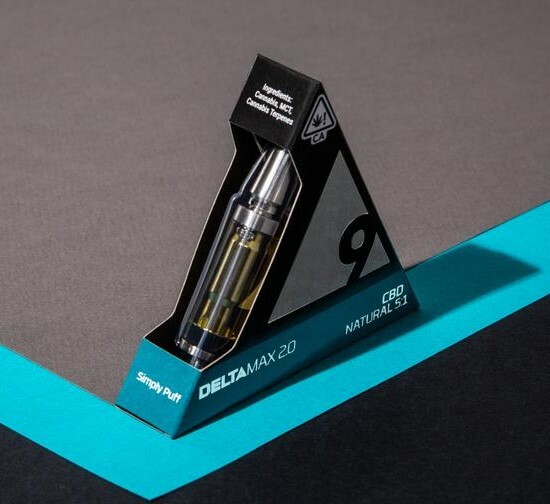 The CBD cartridge’s distinct triangular packaging matches the Delta 9 logo, only silver and black with a bottom seafoam green border that includes very basic info: product name (DeltaMax 2.0 CBD Natural), CBD:THC ratio (5:1), and volume by weight (1,000mg/1g). Find a lengthy health warning on the bottom at the box. Most of the text is silver foiled, which makes the info prominent and compliments the black, silver and seafoam green color scheme. On the back, the seafoam green border notes that the CBD cartridge is all natural, contains no artificial flavoring or PG (propylene glycol), a potentially harmful thinning agent used in some vape oils. 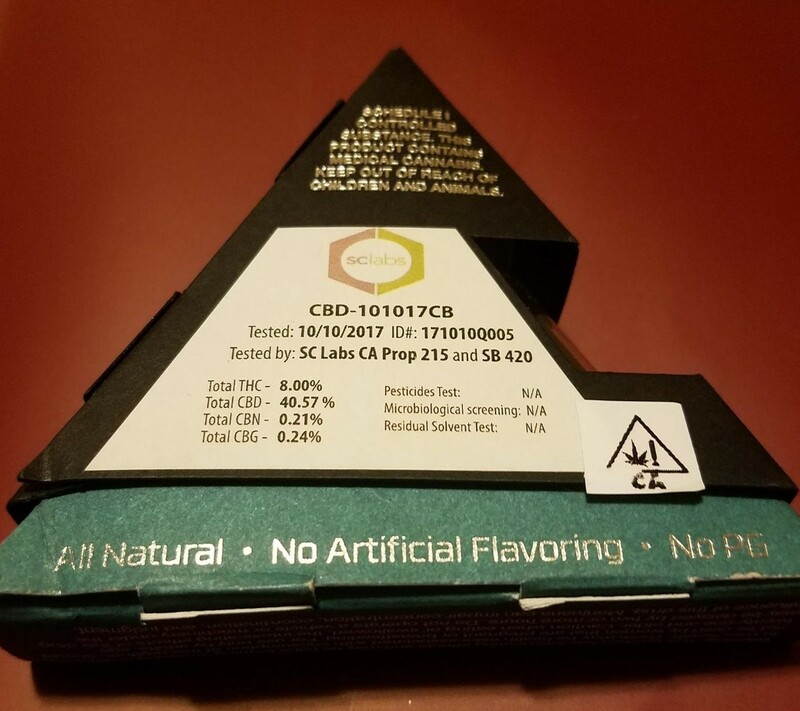 Above this info is a sticker label with SC Labs’ test results, testing date, ID number, and cannabinoid percentages (40.57% CBD, 8% THC, 0.21% CBN, 0.24% CBG). There are also tests for pesticides, microbiologicals and residual solvents, though all three say “N/A” and isn’t helpful. They should say “Passed” or “ND” (Not Detected). Is Delta 9 just trying to appear thorough? The lack of a confirmable QR code fuels my suspicions. I wish Delta 9 included an ingredients list so I can verify what makes up more than 50% of this cartridge. The cardboard seems fairly sturdy and has a window so you can see the CBD oil. Looking at it, I can only assume there are some unwanted fillers. While I appreciate the four different cannabinoid percentages, I’d love to see info on their extraction process along with a major terpene profile. I also notice “Natural” printed three times, which makes me a little skeptical when I’m bombarded with an “all-natural” message. A false sense of security like those unknown testing results? Inside, the large cartridge sits in a hinged, clear plastic package. The plastic could be a little thicker but overall provides ample security. The metal mouthpiece is conical in shape, almost like the tip of a pen, while the tank below has the Delta 9 logo etched onto the glass. It’s sturdy metal and glass construction is much thicker and heavier than most other vape carts I’ve tried; even wider than the vape battery. Before heading out I take two hits. I taste an overpowering woody flavor followed by a subtle sour taste indicative of CBD. The clean and clear airflow doesn’t clog and actually whistles when you take a high-pressured drag. This is due to the wide intake holes surrounding the bottom of the tank that assure all the oil is used. As I continue to vape the flavors start leveling out, though the profile still isn’t my cup of tea. It provides consistently thick clouds that were incredibly smooth, even if you take a massive hit. However, the crystal-clear amber oil appears very thin as it moves around the cartridge too easily, usually a sign of additives. The cart is compatible with any standard 510-threaded pen battery yet the heavier, bulkier design adds more weight so hold on tight; it made my vape pen jar tip over! With this stronger than average 5:1 CBD:THC ratio I was expecting to feel less sore from just one pull. That wasn’t the case. Three solid puffs later, I noticed my biceps, chest and thighs weren’t so tender while walking to the store. Still, I found myself puffing every half hour to maintain this relief so it didn’t help nearly as much as other CBD vapes I’ve tried like Marley Natural’s Marley Red cartridge. But don’t be discouraged; if you have a low tolerance or are new to cannabis, you may find the subtle, clear-headed calm worthwhile. As for cost, $50 usually gets you a full gram cartridge of CBD vape oil, which is usually more expensive than THC carts and even some Pax pods, so a full gram is a solid deal. Distinct triangular packaging, silver foiling, and seafoam green cardboard (Mulder and Scully, eat your heart out). Cut out lets you see the cartridge and oil. Plastic could be a bit thicker for better protection. Term “natural” is printed three times, which raises an eyebrow. Unlabeled 50% of cannabinoids and terpenes remain a mystery. Would like to have seen the ingredients, brief explanation of Delta 9’s extraction process, and a major terpene profile. 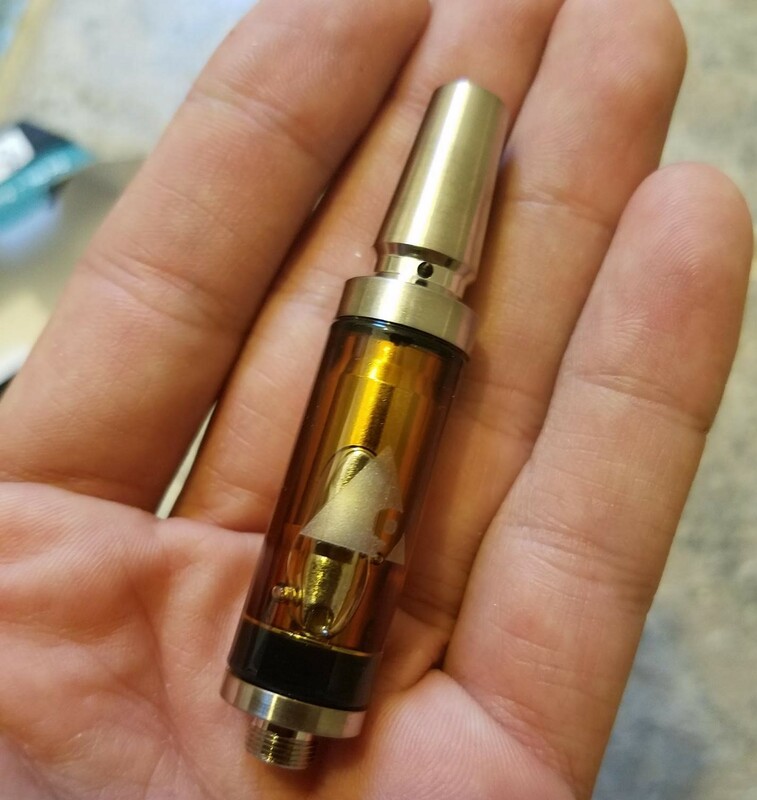 Thick metal and glass construction; more durable than any other cartridge I’ve seen. Bulkiness makes this DeltaMax 2.0 hard to bring along for the ride. Easy airflow without clogging; allows you to take a high-pressured drag. First hit was woody and a little sour, which I associate with CBD flower. Consistently thick clouds with no coughing. Smooth, even with a massive hit! Thin and runny oil, usually indicates the use of a filler. Overall oil quality was a disappointment. As anticipated with the 5:1 CBD:THC ratio, hardly felt psychoactive effects but the CBD did ease my sore muscles. Had to take a few puffs every half hour. Not as effective as other CBD-rich vapes I’ve tried, as the effects wore off relatively quickly. Might be ideal for new users or someone with a low cannabis tolerance. Cartridge can be used with any standard 510-threaded battery. Heavy weight makes it easy to tip and fall out of your hand. Too bulky for my liking; not easy to transport. Provides large clouds of vapor consistently, without clogging, down to the last drop. Wide intake holes helps to make this possible. At $50, this is a solid price air price for one gram of CBD-rich oil, as many half-gram cartridges cost even more. The DeltaMax 2.9 Natural CBD 5:1 cartridge is constructed with the highest quality glass and metal I’ve seen in a vape. The hits are clear and smooth while the vapor quality can’t be beat. However, the oil was too thin for my preference and the taste wasn’t anything special. Combine these attributes with the minimal effects and it’s decent, not jaw-dropping. While it didn’t provide more permanent sore muscle relief, it’s worth trying if you want a lower potency, CBD-rich cartridge that won’t clog for a good price.